I'm sure that you, like me, have been seeing all of the chicBuds giveaways all over the blogosphere, and have been trying to win one! I hadn't been lucky enough to win any, but I was lucky enough to be able to review a pair and give away a pair to a lucky winner here on my blog! *chicBuds have a built-in retractor so that the cords will not tangle. *chicBuds retractor will allow for 5 stopping points so you can adjust the length. *chicBuds has nearly 100 Swarovski crystal pieces. *They have a fastening clip so the cord doesn't bounce around... and you can clip it on the side of your purse so you don't lose them. *They are perfect for working out (no tangled cords, adjustable cord length and fastening clip) and they are great for traveling. chicBuds are compatible with personal CD players, iPods, and computers. You can even purchase ones for your cell phone! They come in a variety of styles and colors. You can also find some chicBuds in select stores. First of all, did you know that I love SPARKLE?! That's what first attracted me to chicBuds. Now that I've tried them, I can honestly tell you that chicBuds are practical, durable, economical, and GORGEOUS earbuds. I don't even own an iPod or anything so I gave them to my daughter for the CD player that she has, but I can't say that I haven't use them when I stole, I mean, borrowed my son's iPod nano! chicBuds are comfortable and I don't have to worry about the cord getting in my way if I'm doing something! 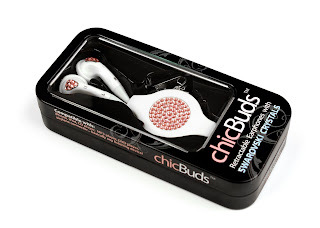 Would you like to win a pair of chicBuds? 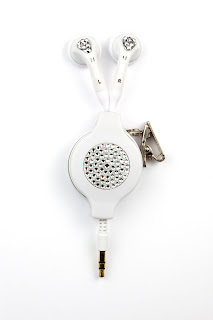 chicBuds has graciously offered to give one A Simple Kinda Life reader a pair of white chicBuds! Go to chicBuds and have a look around. Then come back here and tell me which style or color you like the most! *Remember: if this rule is not followed, no others will count! That's a total of 19 entries if you do them all! Please remember to leave me your email address in your comments if your email address is not available in your profile. This giveaway ends on June 13th, 2009, at midnight EST. My favorite Chic Buds, are the Rock Buds, in Rock Band style. Ooh, I need the chicBuds Earphones: White/Sour Apple to match my pale green Ipod! I like the black with sour apple! I like the Violet Love Buds... way cool! Love the black with watermelon crystals. I like the black chic buds with watermelon crystals. I love the Grape Sorbet and Black earbuds that are compatible with any listening device! 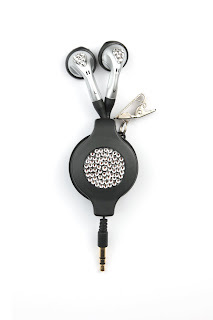 My favorite chicBuds are the Black chicBuds Earphones! Loving the gal to gal breast cancer buds! ooh! i love the black with watermelon! I love the black with watermelon! My favorite color is Watermelon. It is super cute!!! I like the Designer Series chicBuds: White/Blue-Raspberry Swirl ! I like the black and sour apple chic buds. I like the Black/Blueberry chicBuds the most. I'm following you on Twitter (deanna_j). I'm following chicblvd on Twitter (deanna_j). I'm following chicbuds on Twitter (deanna_j). I'm following chicbudsjr on Twitter (deanna_j). I'm following your blog using Google Friend Connect. I'm following your blog on Facebook (Deanna Devendorf McClellan). I love the Rock Star design the best. My favorite are the Black Star Power chicBuds. I follow chicblvd on Twitter. I follow chicbuds on Twitter. I follow chicbudsjr on Twitter. I am now following you on twitter. My twitter name is Susan55. I blogged about your giveaway here: #! I love the White Marshmallow pair the best. Voted for your blog at MomFaves.com. You were at 13 faves. I love the white chicBuds with Sour Apple, since my ipod shuffle is the lime green one. They'd be a perfect match!! & I grabbed the button (previous blog link listed). Whew! Do I have a good chance now? This is such fun. Thanks! Oh, and I emailed 3 friends too. I like the Violet Buds ! Love the Technie girl kit with the cables for the ipod, that's too cool! I LOVE THE BLACK HEADPHONES WITH THE PINK ACCENTS. I SUBSCRIBET TO YOU BLOG THROUGH EMAIL. I would LOVE the black chic buds in grape! They are adorable. Loving the chicBuds Earphones: Black/Watermelon! Thanks for the chance. I like the White/Marshmallow chicBuds! The violet love buds are just adorable. Love these! My favorite - it was either Watermelon or Sour Apple - both perfect for summer. Okay, gotta decide.......Sour Apple, final answer. Oh, and white, of course. I follow you on twitter. I'm janetmom2maya. I've seen you at Amy's twitter parties - fun aren't they?